Are you ready for this folks? I'm not exactly sure that I am. We've reached that magical/horrible/terrifying moment in time when Bookworm1 is reading faster than I can keep up with him. Now thankfully I've been a long term fan of middle grade fiction and have built up a library of things that I know are not just safe, but good for him to read. But he's read all titles I had available for him and now I am scrambling to find things that will suit him. I love that he's a voracious reader though so no complaints. I received a copy of Ranger in Time #1: Rescue on the Oregon Trail in the mail for review. As it was not a book I requested or agreed to accept, I wasn't sure that I would get around to reading it. However, the thought occurred to me that Bookworm1 might like to do so. I perused the first chapter and flipped through the book a bit to see whether or not I could find anything instantly objectionable and I could not. So, without further ado, I offered it to Bookworm1 who thought it looked interesting and he read (and enjoyed) it. Ranger is a golden retriever who has been trained as a search-and-rescue dog, but can't officially pass the test because he's always getting distracted by squirrels during exercises. One day, he finds a mysterious first aid kit in the garden and is transported to the year 1850, where he meets a young boy named Sam Abbott. Sam's family is heading west on the Oregon Trail, which can be dangerous. It's up to Ranger to make sure the Abbotts get to Oregon safely! 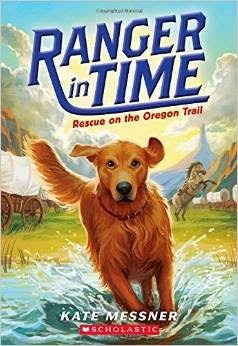 This book is about a dog named Ranger who goes on a trip to Oregon. It is a very long trip and there is a very big river that must be crossed. It was so big that some of the men got stuck and Ranger had to help them out. Q: What was your favorite part of the book? A: When people were trying to swim and get away from a big, rushing river. A: Yes, it is very exciting. This book is roughly 125 pages long and the format is very easy to read (i.e., large font, ample spacing). It took him about 3 reading sessions to complete the book. Rescue on the Oregon Trail is the first book in this series. The second, Danger in Ancient Rome is set to be released at the end of June. 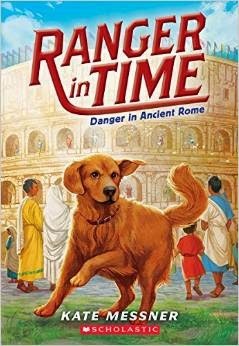 Ranger travels to the time of gladiator fights and wild animal hunts at the Colosseum, where he rescues a servant boy from a runaway lion. But for gladiators and the servants who help to run the games, there's no escape from Emperor Domitian's brutal world of the arena . . . or is there? Something tells me that I will want to preview the next title as Bookworm1 might find a little more excitement than he is currently bargaining for. Still, I'm intrigued by this series and like that there's some historical fiction available to kids that is not related to the American Girls or even Magic Tree House. Not to say that we haven't enjoyed both of those series of books, but I think a search-and-rescue dog is a unique and fun twist on things. Glad to see it, Scholastic. Many thanks to Scholastic Books for sending a copy of this title my direction in order to facilitate this review. We received no additional compensation and all opinions expressed are our own. :) That's so neat that Bookworm 1 is ready to review. Bittersweet that he's ready your library already! This book looks like something I would have loved to read as a child. Bookworm1, welcome to the review world! :D I hope he has fun telling YOU all about the books you should read and enjoy! This new Scholastic series sounds promising for young readers, I must say!